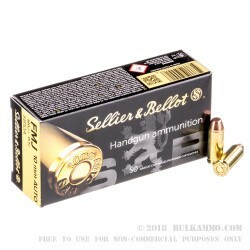 Your Bren Ten or Colt Delta Elite will run flawlessly with this ammunition from Sellier & Bellot. 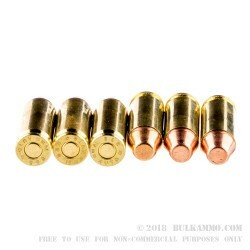 These Czech-made 10mm Auto rounds are manufactured using top-grade components. 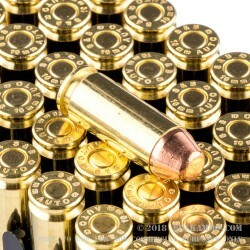 These include reloadable brass casings that are checked for proper wall thickness and non-corrosive Boxer primers that are free of mercury. 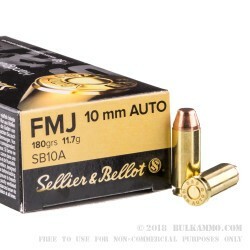 These cartridges fire a full metal jacket (FMJ) bullet that weighs in at 180 grains and offers shooters a balance between felt recoil, flat trajectory, and practical training impulse. A sloped ogive grants the bullet seamless feeding while a flat nose helps create clear, circular holes in paper or cardboard targets. This effect allows shooters to measure their groups with precision for more effective practice. Sellier & Bellot has a rich history of component and cartridge production which reaches all the way back to 1825. 100 rounds fired from a sandbag rest; new Glock pistol. Ammo functions perfectly as did the pistol. Q: What’s the listed velocity of this round? A: The manufacturer lists the velocity at 1164 feet per second. Individual results may vary.